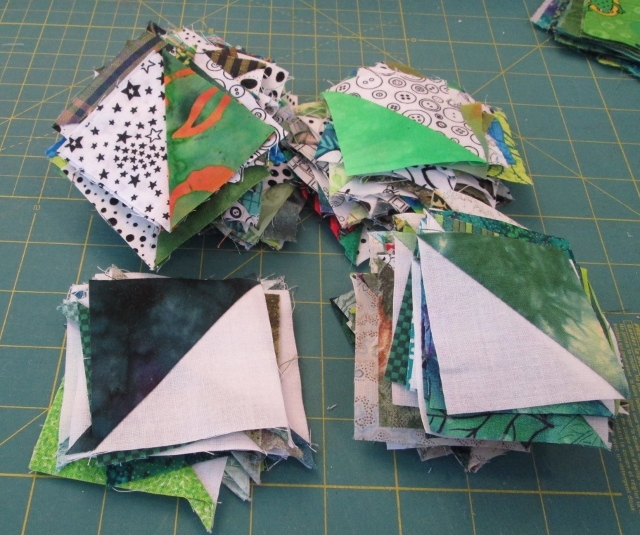 Cathy Tomm Quilts: Where is the Green? We have no sign of spring here. No sign of green outside yet, still lots of white stuff. It snowed again last night. The roads have been bad for three days. Time to stay inside a sew up a storm. I have my green scraps well sorted. This is a pile of green and neutral triangles I have leftover from past projects. 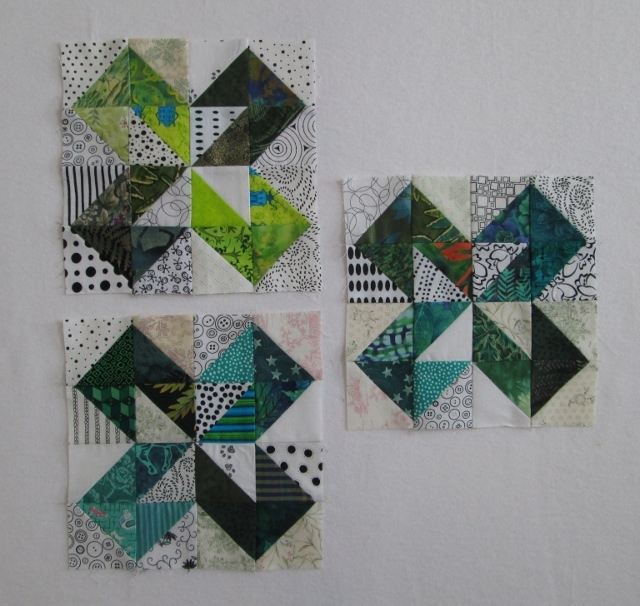 I can do lots with them for scrap blocks. 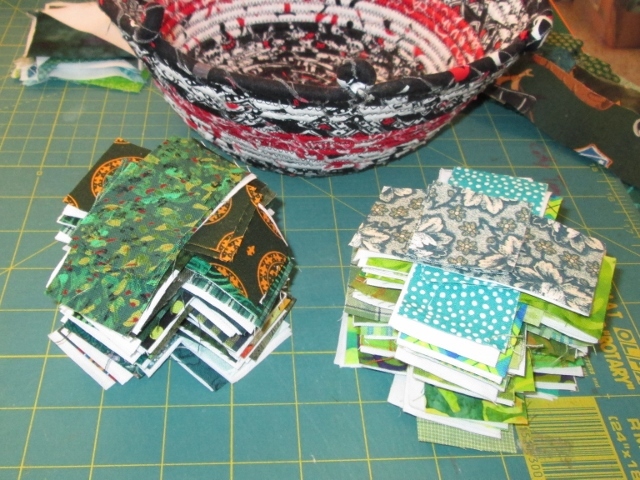 I made kits of green spools out of the scraps. I am thinking I have around 50 here so far. I place them in the red and black fabric bowl and have it next to my machine as Leaders and Enders. This stack should do for the month of April. I got three Jack in the Box blocks done using the triangles I had. I got the pattern from Bonnie Hunter's Addicted to Scraps Here. I used the 2 1/2" unfinished Triangles. I have no plans to use the sashing in the pattern shown but maybe no sashing at all. I had a few Orange blocks done last week. This week I went back and did the pink and purple blocks too. 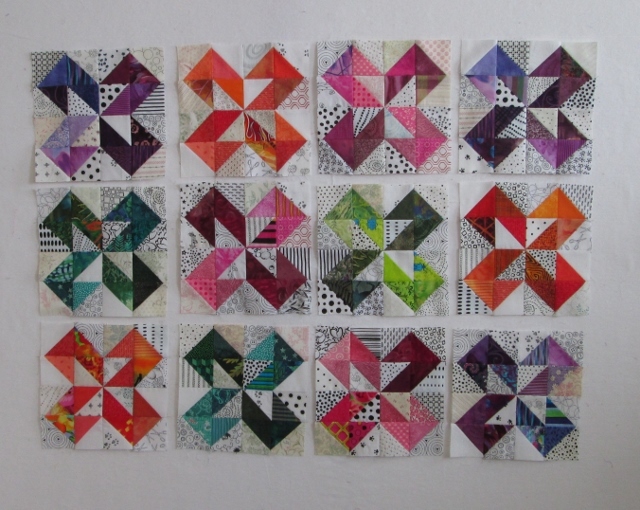 I am thinking I might add blue and yellow ones later and then just finish this one into a small quilt. I do not have any new extra baby quilt. They are good to have on hand in case you need a gift. I have added today's post to Soscrappy were you can find more green scrap projects. I am a day late posting but I guess late is better than never. Yesterday was a Dog Agility Trial. Lex and I passed our first Master Standard class. It was a tough course too, many good dogs and handlers did not fair well. Lex saved me on one jump as I made a mistake in handling. A very good boy, he was. The roads to the trial were not good in the morning. I had a close call, as a driver came down the Devon bridge crossing on the wrong side, in my lane. I had a truck in front and in the other lane so I just saw the car in the last seconds and had to change lanes. Felt the Van slip but stayed on the road. Wow to close a call, Glad to be ALIVE. Your green blocks look great. Sounds like an eventful weekend full of near misses. Hope things calm down for you this week. Love your blocks. I enjoy watching you make these block in different colors. I'm so glad you are okay. Looks like you've got yourself very well organized and plans made for your greens. I spent yesterday organizing my bins and getting the scraps pressed and sorted. Next week I'll get to do some sewing with them :*) The Jack blocks are looking great!!! Really like the Jack in the Box blocks - especially the black and white prints you've chosen for background! Hope Spring arrives in your neck of the woods soon. Bad roads are no fun - glad you're OK! Great Jack in the Box blocks. Your Jack in the Box blocks look really nice. I think they will make a wonderful baby quilt. So glad you are okay! Your Jack in the Box blocks are looking terrific! Oh my, what a beautiful set of blocks you have there.